Fishing during a cold front always presents some interesting situations and today was one of those occasions. Bob and Tom were part of a 5 boat trip out of Key Largo and there was a pool of cash and bragging rights at stake for biggest fish. With cloudy skies, a cold 20 MPH wind and dirty water we headed out to have a good time, catch some fish and hopefully get them the pool of cash up for grabs. Fishing a creek I like produced just a few fish and a few lost fish to the bottom. A tarpon rolled about 100’ away never to be seen again. We moved and staked out at the edge of a flat and targeted big mutton snappers. We caught several muttons, hogfish, and a small shark but no big muttons. Towards the end of the trip we staked out on a favorite flat of mine and began to shark fish. We had a few hits but no sharks. At the end of the trip, 4th quarter and 2 minutes left, one of the rods goes off, Bob grabs it and something jumps clear out of the water. 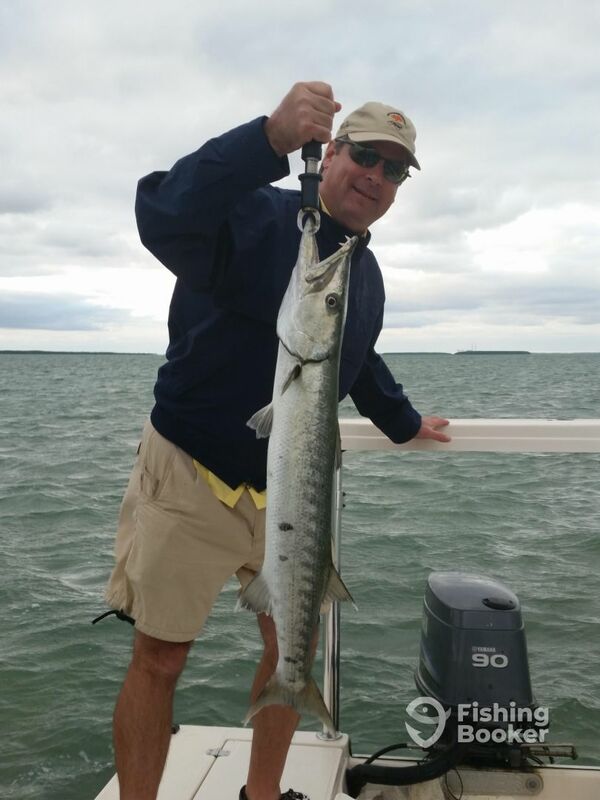 With drag screaming and rod bent, Bob brings to the boat a big barracuda. A few pictures later we release it and head in. Later on Bob send sends me a text letting me know they won bragging rights and the pool of cash with the largest fish. Congrats Bob and Tom!